The Seek thermal cameras supplied by Horne Technologies can help detect problems ranging from air leaks to electrical shorts to missing insulation. 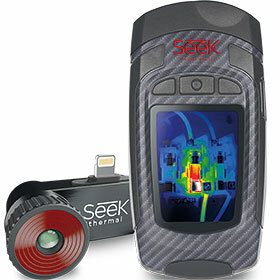 Made for iPhone and Android top models, the Seek Compact transforms smartphones into a professional thermal imaging tool. By utilising the smartphone, thermal photos and videos are easily taken, findings shared and documentation recorded. All that is needed is to connect and open the app. Engineered to run on low power from smartphones, the cameras do not require batteries or charging. With a powerful and rugged design, the standalone Seek Reveal combines high resolution thermal imaging, a long-lasting rechargeable battery, and a large colour display in one durable device with rubberised casing and intuitive controls. Reveal’s powerful 300 lumen LED light is available at the touch of a button. The health of buildings can easily be assessed using non-destructive thermal imaging technology. HVAC systems can yield the single largest potential saving on utility costs. The health of heating, ventilation and air conditioning systems is often difficult to track and monitor with traditional tools. A previously cost-prohibitive technology, infrared thermal imaging, is a tool that is now becoming widely adopted by HVAC technicians. It can find refrigerant leaks, spot loose connections, diagnose bad valves, detect energy losses, see corroded fuses, overloaded circuits and overheating pumps or motors, and locate unbalanced loads. All this adds to security at work and home.